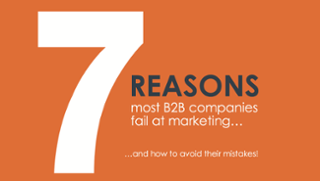 7 Reasons Why B2B Companies Fail at Marketing and How to Avoid their Mistakes. Have you noticed that what used to drive revenues for your business no longer cuts it? So what are you doing to drive success? Dipping your feet in strategic marketing perhaps? Like with most new endeavors, learning a new skill comes with challenges. Join Lisa Shepherd, Founder of The Mezzanine Group, for a complimentary webinar where she discusses the top 7 reasons why B2B companies don’t succeed with strategic marketing, and what steps can be taken to avoid the common traps.